1964 McDonagh Twin Fin Belly/Knee Board 4 ft 9"
Foam blank with 3/4'' redwood stringer, Volan glassed with red resin pigment rail panels..
6 1/2" x 9 1/2" base x 10'' span @ 5 1/2''. White coloured pigment in fibreglass mat. 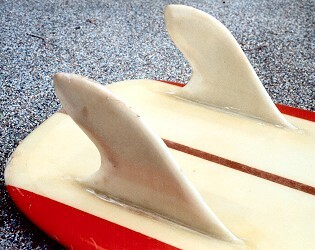 The fins are tipped out towards the rails. 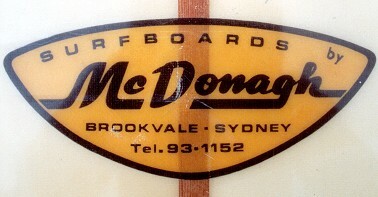 Surfboards by McDonagh. Brookvale. Sydney. Tel 93-1152. Black and yellow rounded diamond at rear sweet spot. Bottom: Red resin pigment rail panels. Riding position probably prone, as suggested by theTwin fins. Unusually for this period, the fins are definitely tipped out towards the rails..
Greg McDonagh : "How Surboards are Made", 1964. Ten steps by Brooknale manufacturer, Greg McDonagh, with illustrative photographs.